Take a litre of milk, plus half a cup each of cream and milk powder, and in six hours you can create this gorgeously thick snowy-white yoghurt, which has a voluptuous texture and a creamy, tangy taste. I haven't bought a single tub of supermarket yoghurt since I nailed this method five months ago, and my family devours it in such great quantities that I make a batch almost every day. This is astonishingly easy to make, and foolproof if you follow my instructions to the letter. As I've mentioned on this blog before, I'm smitten by Greek yoghurt because it's such a versatile and interesting ingredient. It's a good substitute for cream, a brilliant tenderising agent, and packed with protein, calcium and gut-friendly probiotics. I use this yoghurt in marinades, dips, salad dressings, sauces, stews, soups and ice creams. If you're following a low-carb or diabetic regime, you can use this ingredient with confidence in your kitchen. This recipe makes three to four jars of thick natural yoghurt. You can make this with ordinary homogenised supermarket milk alone, but you will end up with a rather thin and meek yoghurt. Please trust me when I recommend that you add instant milk powder to thicken and enrich the yoghurt, plus a modest half-cup of cream for taste and a silky texture. In the recipe below, I've given instructions for heating the milk in a microwave oven. I do this to save on washing up, because this method uses just one big plastic or glass bowl. If you don't fancy microwaving, you can heat the milk in a pan and then transfer it to a bowl. I've tested this recipe umpteen times using a variety of starter cultures. 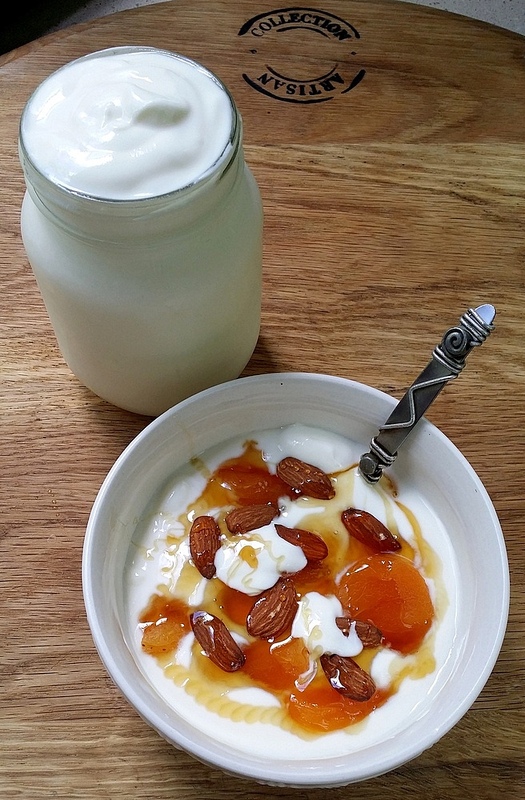 Any natural Greek-style yoghurt from your supermarket will do for your first batch; I suggest you experiment with different cultures (mixing and matching them if necessary) until you are satisfied with the taste and texture. I have had the best results from Woolies Double Cream Greek Yoghurt and Buffalo Ridge's yoghurt, and I have mixed them up over the months to create my own culture. I make this in my amazing Wonderbag, but I've also thoroughly tested the recipe using a dense woollen blanket, and detected no difference in the final product. This recipe is quite forgiving as regards its temperature when you add the culture. I've added the culture when the milk is just above blood temperature, and I've added it when it's still quite hot, and there has been no discernible change in the outcome. Although this is an easy recipe, I've written detailed instructions below so your yoghurt turns out perfectly every time. Set the mixture aside to cool for about 25 minutes. To help prevent a skin forming, cover it tightly with clingfilm, or press a sheet of clingfilm to its surface. When the mixture has cooled to the right temperature, it's time to add the culture. Here's my method of judging when the temperature is right: stick your index finger into the milk. Count slowly up to six: if you can bearably hold your finger in the milk to that count, without it burning, it's ready. Scoop out about half a cup of hot milk, place it in a little bowl and whisk in the Greek yoghurt starter culture. Gently trickle this mixture back into the bowl and give it one more very gentle stir. Replace the clingfilm and wrap the bowl in a thick woolly blanket that you've folded in half or into quarters. Set aside for six hours - or overnight if you like - without unwrapping, shaking or disturbing the yoghurt. When you open and remove the blanket, the yoghurt will have set to a beautiful wobbliness. Give it a light stir with a balloon whisk, replace the clingfilm and leave the bowl on your kitchen counter to cool to room temperature. 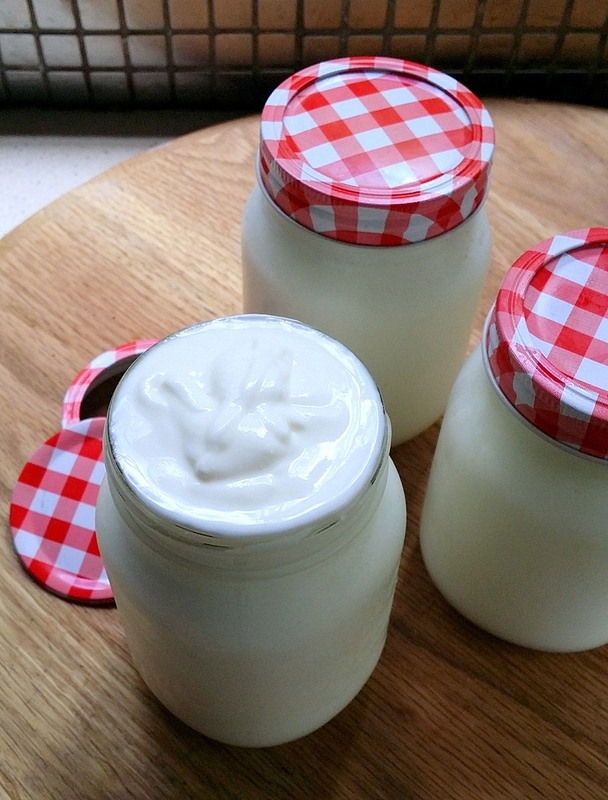 Decant the yoghurt into glass jars - or lidded plastic containers - and refrigerate. Keeps for up to ten days in the fridge. Makes 4 x 250 ml jars. Guess what I will be making in the morning. What brand milk powder do you use? Can't wait to try this! Sounds great, Jane-Anne. I've been making regular yoghurt for a couple of years now, but haven't made it into luscious Greek yoghurt with cream before. I suspect it would disappear even more quickly if I did, so will have to think twice before trying it! Do you find that you have to renew your culture every now and again? Mine sometimes starts getting a bit too tangy after several goes. @GOOD FOOD FUN FOOD: Thanks for your comment! Let me know how it turns out. Hi Anonymous. Thanks for your query. I use a Spar housebrand (instant skim milk powder)which you can find in any Spar. Made it on Friday and it's nearly gone! Absolutely delish! So now not only do I have my regular bowl and sieve with Amasi doing its wonderful cheesy thing, but I have a blanket wrapped bowl on my kitchen counter! Thanks again for another awesome recipe! This looks great - my husband eats a LOT of Greek-style yoghurt. Could I make it without the cream? Would it be a more "low-fat" version? And with the next batch, do you use a bit of the previous batch as a culture, or how do you keep your culture? I'm totally new to yoghurt making (all advice appreciated!!). Thanks so much!